*SPOILERS AHEAD* If you didn’t know that this space is where episode recaps (with random bits of commentary) occur, now you do. So if your mind’s not ready to know exactly what happened in this episode, avert your eyes. Now. You’ve been warned. There’s a reason why Friday the 13th has come to be widely reckoned as a day of ill fortune: it was on that particular Friday in October of 1307 that officially marked the beginning of the end of the Templar Knights. But that’s an episode for a later day …we hope. 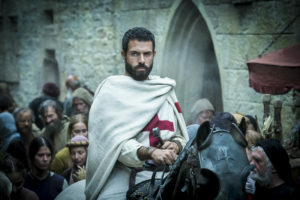 But in the meantime, Knightfall jumps off in 1291 where Templar Knight Landry (a veteran of the Crusades played by Tom Cullen, Downton Abbey), his mentor and father figure Master Godfrey (Sam Hazeldine, Peaky Blinders), and their brotherhood of warrior monks find themselves on the losing end at the Siege of Acre, the Templar’s last stronghold in the Holy Land. In addition to lives, the city and a semblance of trust being lost (someone has betrayed them, allowing the Sultan’s army a way into the temple), so is their most precious relic: the Holy Grail. When the ship carrying the Grail to safety explodes (damn that trebuchet! ), the relic sinks to the bottom of the sea. Fast forward 15 years later to Paris where the Templars have set up shop not only as protectors within France but also as a wealthy banking group. When King Philip IV of France (Ed Stoppard, The Crown) and Landry meet at the point of one another’s swords, we find the relationship not what it seems as insults and threats give way to friendly sparring between teacher Landry and student Philip. 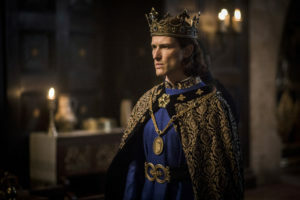 But that sense of dread that you feel when King Richard’s trusted counselor William De Nogaret (Julian Ovenden, Downton Abbey) interrupts the two friends in order to redirect the king to daily business such as the monarch’s increasing financial woes (the country’s debts include outstanding loans to the Templars), go with that feeling. The unspoken ill will (lack of trust, perhaps?) between Landry and De Nogaret is palpable and, of course, King Philip rests in the middle. To King Philip’s displeasure, De Nogaret tosses a dig questioning how friendly the Templars truly are to the king, plus he has ideas of how to help resolve King Philip’s money woes, but unfortunately those ideas include things like subjugating the Jews and confiscating their collective wealth. King Philip is not on board with this: the Jews are under his protection. We are reminded that one important facet of Templar life is monastic: vows of chastity, folks. The fleeting glances between Landry and a beautiful townswoman are a note of sacrifices made, but there’s business to attend to. 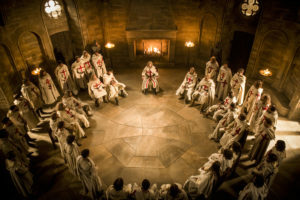 When the Templars assemble to discuss their matters (they are a bunch of wealthy money lenders, after all), Landry (looking bored AF) expresses his discontent for the current state of knightly affairs as their social standing and practical function have been reduced to attending meetings and sitting idly by while unrest in the Holy Land continues, the Jews are being targeted and the Holy Grail is still at large. The latter is a wound that has never healed. To Landry’s frustration, Gawain (Pádraic Delaney, The Wind That Shakes the Barley, The Tudors), a great Templar swordsman rendered unable to fight due to an injury suffered at Acre and fellow knight Tancrede (Simon Merrells, Spartacus, Dominion) remind Landry of a longstanding Templar mandate of staying out of city affairs. Godfrey attempts to ease Landry’s heart and mind with words that it’s up to God to decide their path but “the wind” is still against them, when the sudden appearance of an orange curiously perched upon a ledge (yes, that confused me, too) instantly alters Godfrey’s mind. Where did the orange came from? Who placed it there? Why is that the equivalent of the Bat Signal? These questions are nowhere near answered but, suddenly, Godfrey declares that the Templars must protect the Jews and takes off on a mission. Alone. That will not end well for the master. While on the road to we have no idea where, Godfrey is set upon by highwaymen who chase him towards a farm where commoner Parsifal (Bobby Schofield) lends a battle assist. The lives of three of the four bad guys comes to an end on that farm (with one death rivaling the gore factor which you might see on Vikings and Game of Thrones), but Godfrey’s wounds are also mortal and Parsifal’s work is not done: with his dying breath, Godfrey charges Parsifal with returning his sword to Landry in Paris. “He’ll know what to do. God’s kingdom depends on it.” Godfrey groans. Dramatic, much? Speaking of Landry, our upright knight taken to scaling walls and climbing into windows for intimate encounters with the beautiful woman of the fleeting glances. Wordplay reminds you that Templars aren’t supposed to partake in the pleasures of the flesh, but Landry’s emotion and humanity remind us that even monks are but mere flesh and bone and subject to failing in the eyes of God and Landry is definitely lost. It’s a curious case of the not-so-celibate monk and it’s complicated…to be continued. A random murder of a Christian by a Jew happens in broad daylight. Parsifal delivers Godfrey’s sword into Landry’s heavy hands and asks a mourning and confused knight what it is he will do. “He said you’d know what to do.” Parsifal says, but Landry has no idea what that means. But what he does know is that Godfrey’s body must come home for a proper burial with his sword: Gawain will see to it. Of course, what would medieval times be without a little palace intrigue, conspiracy and shady scheming? Wandering the halls of the king’s castle, Landry’s secret lady love hovers in shadows and overhears De Nogaret’s henchman briefing him on the success of his mission: murdering that Christian while impersonating a Jew which effectively sets up the excuse De Nogaret needs to advise King Philip to expel…I mean evacuate the Jews from the city for their safety, of course. It also sets up De Nogaret’s next plan: having the Jews murdered and stealing their money during their “evacuation.” In short order, secret lady love passes this intel to a none too pleased Landry who, having been left in charge in Godfrey’s absence, leads the Templars out to head off the ambush. During the fight and not content to leave her fate in the hands of other men, one Jewish woman Adelina (Sarah-Sofie Boussnina, The Bridge, The Absent One) takes up a weapon and helps defend her people. She and her father were among those that the Templars saved 15 years ago in Acre. Also, to be continued. Back at Parsifal’s farm disaster has struck: upon their arrival to retrieve Godfrey’s body, he and the Templars arrive to find the body of the girl Parsifal thought to marry on display with an arrow through her throat. A message or, perhaps, payback from the highwaymen for his interference with Godfrey. Back in Paris, De Nogaret feels the weight of King Philip’s displeasure upon hearing what happened to the Jews and chastises De Nogaret not to overstep his authority or think him weak. After making his point, King Philip heads off to dine with the nobles and his Queen, Joan of Navarre (Olivia Ross, War and Peace) …you may know her as Landry’s secret lady love. So, yes, that is going to be a thing. It’s all so very Arthurian. Meanwhile, while Godfrey’s sword is being reverently cared for at the temple, it reveals a secret of its own: the first clue to the whereabouts of the missing Grail. It’s a little on the Easter egg side of things, but the clue shows a cup bearing the image of the Fleur de Lis: the Holy Grail is in France. 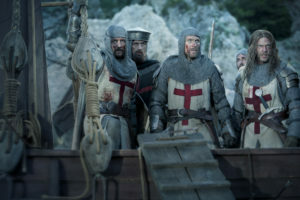 With the Templar Knights’ history being a dynamic weave of religion, warfare, politics, honor and lore all – of which make antagonistic bedfellows on a good day – what we are dealing with is that classic convergence of historical fact with fantasy in hopes of being a vehicle of simultaneous entertainment and education. In that endeavor Knightfall hits and misses in parts. Here the intent is to tell the story (or a story) from the Templars’ perspective as opposed to them being a simple trope or plot device, bringing them out of the shadows of Assassin’s Creed or The DaVinci Code and bearing their truer selves but also leaning on enhanced dramatic effect, the mystical and intricate story puzzle pieces. This is me daring Knightfall not to get overly caught up in being overly fanciful with its liberty-taking, but also for show runner Dominic Minghella to step up the fluidity of storytelling. It’s to be expected – as scene by scene we establish the players and their individual stakes in their medieval world – that things can feel somewhere between plodding and disjointed, and the somewhat perfunctory dialogue proves that there is a lot of ground to cover in these first 44 minutes. So we will give Cullen a moment to relieve Landry of his somewhat sullen brood because those moments we see his character flash with warmer blooded, complicated emotion will make this viewing far more interesting, especially when paired with Ed Stoppard’s conflicting quest for power as King Philip. And yes, Julian Ovenden’s De Nogaret is very Littlefinger-lite complete with whispery hallway conversations, faux devotion to his betters and self-serving interests: not sure whether to be amused or offended by this, yet. Battle scenes are aplenty and while perfectly serviceable with violent swordplay and doses of slow motion for good measure, Knightfall does utilize a unique perspective: that from within the knight’s helmet. At first jarring and claustrophobic, but ultimately strangely intimate and genius. When it comes to the setting and scenery, Knightfall also utilizes some of the most pristine, if not oddly neutral, lands in Prague which seems somewhat antithetical to the realities of a 13th century existence. That said, if DVR is a thing at your disposal, when De Nogaret comes upon King Philip praying in church and the camera descends, pause it. Take 10 extra seconds to acknowledge and absorb the fiercely stunning play of color and light and architecture. As camera shots go, that one is practically a holy moment on the eyes. Resisting the urge to compare/contrast Knightfall with History’s impeccable Vikings (whose season 5 also premiered tonight) may prove difficult, but try to go there. On its own merit, Knightfall seems to be aiming for the pleasure of the spectacle more than the elevation of an era and that’s fine: either tact is acceptable. It’s all in the execution and once its primary purpose is settled upon, hopefully Knightfall will find its full footing. I’m hoping that will be the case because we’ve got a ways to go before that fateful day in October.